I mentally ran through every Mark I had ever met: three gas engineers (they are all called Mark; it’s a requirement of the job. So much so that I call the third one Gas Mark Three. ), an estate agent, a couple of ex-colleagues… nothing was ringing a bell. TheBloke (TM) came into the living room brandishing an exercise book, found at the bottom of YoungestGirl’s spare stationery drawer, where we chuck every conceivable thing she can doodle on. 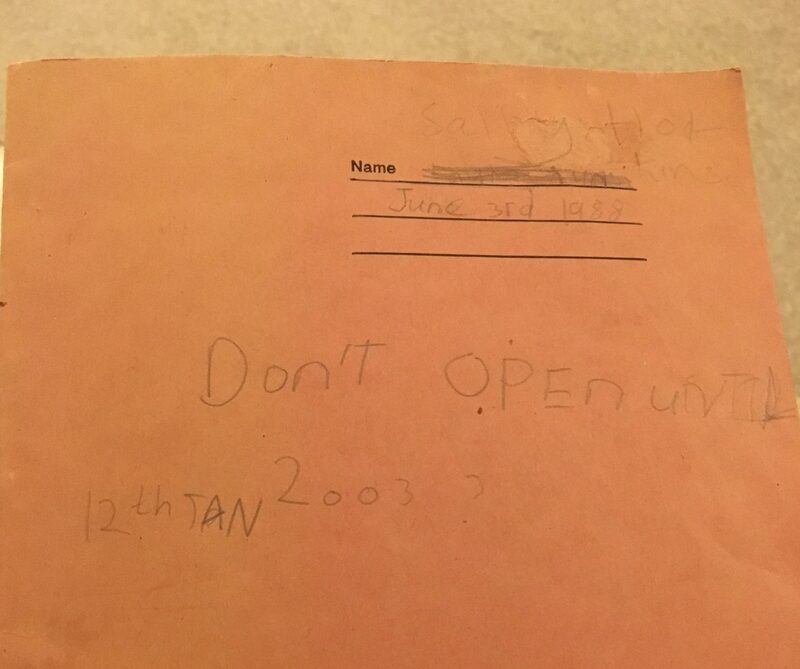 The cover very clearly said “DON’T OPEN UNTIL 12th JAN 2003”. Well, I couldn’t argue on that front. He was nearly 15 years within his rights of this weirdly-specific date. In the top right-hand corner of the book I had crossed out my own name and replaced it – some would say ineffectively – with “Sally Hopkins”, who I’m fairly sure was either made up by me, or possibly by Enid Blyton in the Malory Towers series. This cunning exercise in subterfuge hadn’t fooled TheBloke (TM), who is clearly sharp as a tack. On page 1 of the exercise book, I learned exactly what had incensed TheBloke (TM). It was here I proclaimed my TRUE LOVE for the one and only Mark Dunworth. Apologies, Mark, if you’re reading. I couldn’t change your name because it’s right there in the drawing. Also, I seem to have drawn you at about half my size. I’m 90% sure this is down to my 8-year-old self’s poor artistic skills rather than your stature. No offence meant, mate, are we cool? If you are reading though, give me a call, yeah? TRUE LOVE and all that. 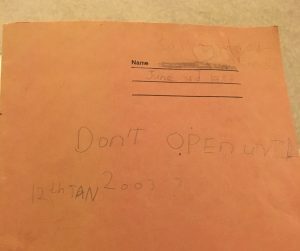 The date on the front of the book suggests I was about 8 years old. I vaguely remember Mark from school, only because he paid me one of the best compliments I have ever had. At carpet time one day, he said to me quietly, “You are definitely the most sensible girl in the class.” Well, what girl wouldn’t be won over by that sort of smooth talk? 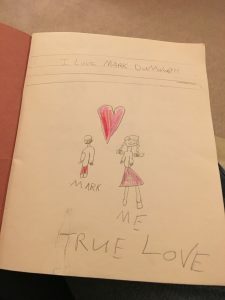 I think Mark moved away (or possibly got a restraining order) and I don’t remember anything else about him. This wasn’t good enough for TheBloke (TM). We met each other via a dating website. Before he decided to settle down with and marry his first date (me), he had been lining up a second person to meet for drinks. 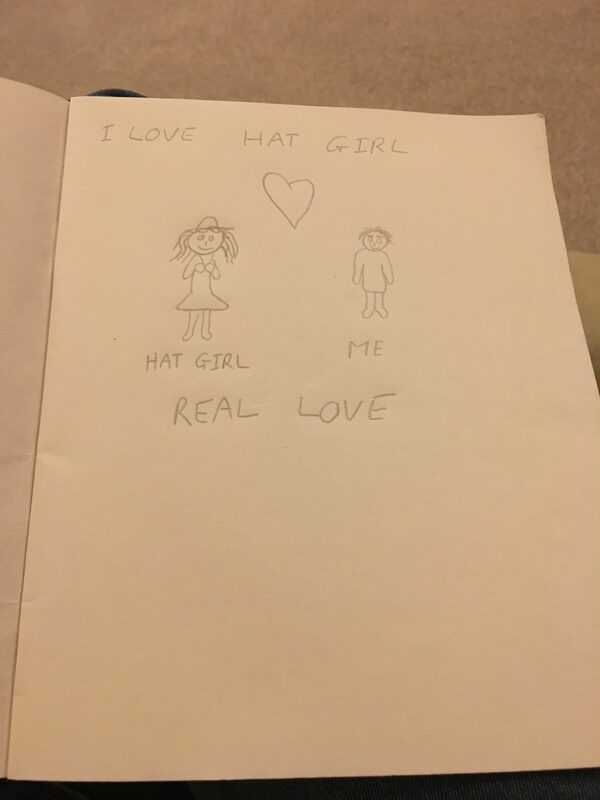 He can’t remember her name all these years later, but he remembers she was wearing a hat in her profile photo. 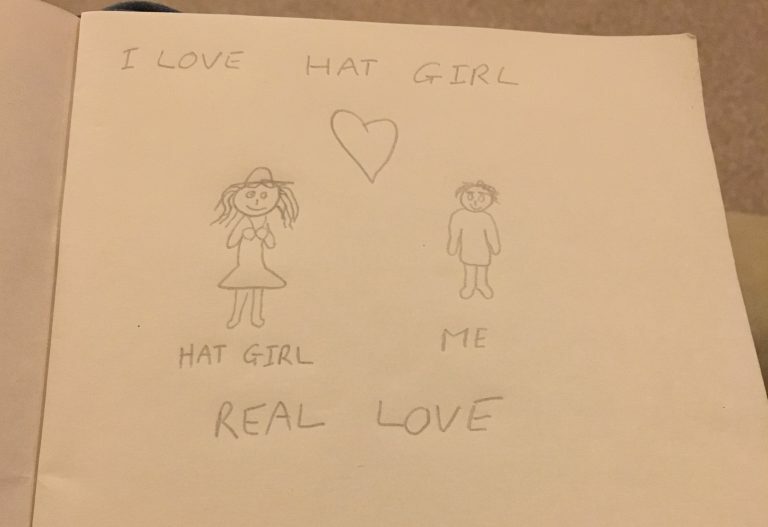 She is known, therefore, as Hat Girl. Her name (“Hat Girl”) is brought up whenever I commit a minor misdemeanour like accidentally poisoning his food or punching him in the balls. “Hat Girl wouldn’t have done that. Hat Girl would have picked me up a KFC on the way home from work. Hat Girl would enjoy watching me play XBox for three hours.” and so on. Stupid Hat Girl. Anyway, a few days later, flicking through the book, I came across page 2 of the exercise book. Our relationship is nothing if not petty and vindictive. Just the way we like it. Actual LOL at the revenge drawing.